Cats are beautiful creatures that we cherish and love. They can calm us down when we are nervous or can make our day better when we are feeling sad. However, they can be sometimes messy and cause troubles too. Finding quality cat litter boxes for your cat can be a challenging task as there are hundreds of different models out there and all come with different features. It is very important for you to find a quality kitty litter box if you want your home to be nice and clean. Today, a very popular type of litter box is the automatic cat litter box which can basically do everything for you, therefore, it’s definitely worth checking out. Here you will learn more about which is the best cat litter box for odor control and which are the best litter boxes overall (as well as which is the best litter box for multiple cats, and is there actually one). That way you will make your cat happy and you will also be glad knowing that your cat is satisfied and your home is kept clean. There are many manufacturers out there that claim that they sell the best cat litter boxes but, obviously, not all of them provide the same quality. The following are some of the best cat litter boxes that you can find on the market today and our top choices within the certain price ranges starting with $$$ (most expensive) and ending with $ (budget/low price). After reading this, we suggest you also take a look at our article dedicated to the best cat litters used in the litter boxes. We shall now go into in-depth reviews of each litter box we’ve chosen as the best within their categories. PetSafe ScoopFree Litter Box is a self-cleaning litter box which is a bit more expensive than other models, but it is of top quality in terms of features it possesses and is also very durable kitty litter box. This automatic cat litter box is a real state-of-the-art, modern litter box that will always be clean and fresh, so you have nothing to worry about. Instead of wasting time to scoop every day, this automatic litter box will do almost all the tasks for you. PetSafe ScoopFree Litter Box will give the cleanliness you desire, so your home will be perfectly clean at all times. If you are searching for the best cat litter box for odor control then PetSafe ScoopFree Litter Box is your ideal choice. A good idea is to put the new litter box close to your cat`s litter box, so the cat will have an easy access to both litter boxes. That way the cat can start getting used to having a new litter box. Another thing to do is to put some of the older and unused litter to the tray of the new litter box, so your cat will follow it. Leave the old cat litter box dirty for some time and avoid cleaning it. This may sound harsh, but all cats love clean cat litter boxes, so the cat will find the PetSafe ScoopFree Litter Box lot more appealing to use. As soon as your home cat has started using the new litter box, throw the old litter box away. If you have kittens that are less than six months old it is advisable to leave the litter box constantly unplugged and to scoop the cat waste manually until they grow up. That way the kittens will get familiar with the litter box more easily and without risks. HM tip: Since you are buying a more expensive model of cat litter boxes, you certainly want the model to last long. There are several things you can do in order to prolong the life of the crystal litter trays. The first and very important thing to do is to put the litter box in a place that is away from moisture. That means away from basements, bathrooms or showers. Due to the fact that PetSafe ScoopFree Litter Box is the best cat litter box for odor control and the crystal litter absorbs the moisture, placing the box near humid places will shorten the life of the tray. So the best thing you can do is to put PetSafe ScoopFree Litter Box in a room where there is a dry air. If your cat has the habit to urinate in the same spot over and over again, another advice is to stir the crystals from time to time for better distribution of saturated crystals. Larger cats that have specific dietary needs and that eat foods that are rich in fiber will certainly produce bigger amounts of solid waste, which can quickly fill the waste trap. In situations like these, you may think about changing the diet of your cat to eat foods without fillers or byproducts. As we have concluded, PetSafe ScoopFree Litter Box is a very simple automatic cat litter box which can operate alone for several weeks. All you have to do is just load it with a disposable tray which has been filled with crystal litter first, plug the litter box in, and see how it works. The sensors are doing a great job at detecting your cat motions and times they enter into the box, so the rake timer is reset every time they enter. At the same time, crystals are absorbing bad odors and moisture and start to dehydrate the solid waste. After about fifteen minutes later, the automatic rake cleans the litter by pushing the waste in the waste trap. The disposable tray should be removed every three to four weeks as needed. As you can see, all operations are done easily and without too much hassle. All of that makes PetSafe ScoopFree Litter Box one of the very best litter boxes overall that you can find on the market today. This kitty litter box can self-clean for several weeks without the need for manual cleaning, scooping or refilling. Works properly only with crystal litter, therefore, you cannot choose to use other types of cat litter, such as clumping clay litter. HM tip: Consider the magnificent PetSafe ScoopFree Litter Box the very best choice UNLESS 1) you have a kitten under 4 months of age, 2) you AND your cat are unshakeable supporters of biodegradable cat litter (as a matter of fact, it’s our personal favorite as well, however, it wouldn’t work properly with this machine). Catit Jumbo Hooded Cat Litter Pan provides extra privacy by keeping the cat litter inside the pan of the box. The hood of the box is large and it can be easily lifted for cleaning. The bag anchor inside is keeping the bag open so your hands are free to scoop the waste. The box odors are effectively eliminated by the quality carbon-based filters that successfully trap and remove the odor. The manufacturer claims that Catit Jumbo Hooded Cat Litter Pan is ideal for multi-cat households. While it is truly great (both in quality and size, as technically you could comfortably place several cats in it at the same time), we as veterinary experts do not recommend 1 litter box for several cats. In fact, if you read our article about cat litter, you’ll notice it best to have more litter boxes than cats, not the other way around. A real treat regarding this litter box is that it can be cleaned very easily. The big opening provides you with a lot of space for you to put your scoop inside and clean the box. Catit Jumbo Hooded Cat Litter Pan is really a large box that you and your cats will definitely love. Among many other top features, the carbon filter is a fantastic addition, while the transparent cover can easily be moved back or up for opening the litter box. This especially helpful if your kitty is not used to entering in a closed litter box. The box odors are effectively eliminated by the quality carbon-based filters that successfully trap and remove the odor. HM tip: Consider this the best value for the money cat litter box available in the market today. In our opinion, the quality features, jumbo dimensions, and being very easy to clean all make Catit Jumbo Hooded Cat Litter Pan make best litter box for cats within this price category. Also, this is definitely a more suitable option for young kittens than the automatic cat litter box as using crystal litter can get dangerous for them at such young age (read more about crystal litter – to which households it’s appropriate). Those people who are on a stricter budget and searching for a low price option should definitely consider Nature’s Miracle High-Sided Litter Box (P-82035). It is definitely one of the best cat litter boxes you can find at such cheap price, and we’ll explain why. Some of the best features of this litter box are the high sides which prevent litter from scattering, the non-stick surface, and easily cleanable spout. It is very easy to use and it comes in dimensions of 23 x 18.5 x 11 inches. It weighs just below three pounds. The design of Nature’s Miracle High-Sided Litter Box (P-82035) is very convenient and easy for dumping cat litter. The front opening is five inches in the center and about six inches on the edges. 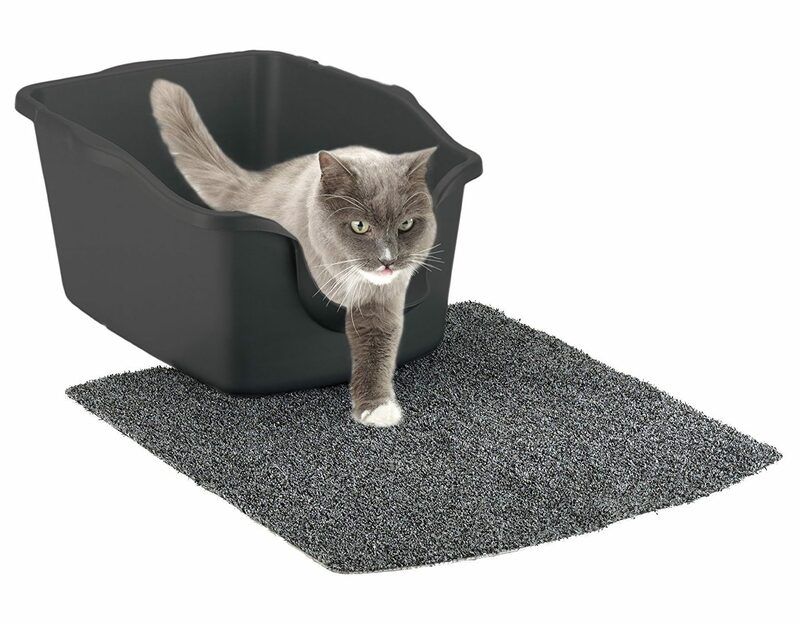 The material is very durable, so this litter box can serve you well for many years. The size of the box is pretty good, although the sides of the litter box sometimes may not prevent your cat to fling litter in the room. However, that also depends on the cat and the type of litter you use, not on the litter box alone. Nature’s Miracle High-Sided Litter Box (P-82035) has a nice entrance, a lip edge which keeps the litter inside the box. The anti-microbial and two-in-one special odor plastics are both amazing features. This kitty litter box is probably the best choice if your cat likes to kick the litter. The high sides of the box are the favorite option to many people, but you should be careful when you scoop not to dump the litter through the entry side which is a bit shorter. All in all, this litter box serves its purpose well, so for a cheap price you really are getting a quality litter box for your cat. HM tip: If your budget is really tight and even our pick for the previous price category ($$) seemed too much, consider this the best alternative for a litter box that cost approx. two times less. For such simplicity, it really does possess the best features described above, and we suggest you get this one if this category is what you’re looking at. If you still want to do some additional research and find other alternatives, we suggest you take into account the features of this one and look for another counterpart. These were our highly researched top picks for each price category. Consider all the pinpoints mentioned in this article before purchasing a new cat litter box. You might also want to read our article about best cat litter where we go in-depth about each type of litter and provide the most valuable tips when choosing the right litter for your four-legged companion, as it varies drastically – for instance, certain types of litters are more suitable for cats with respiratory issues, etc. Make yourself and your pet feel at home. As it should be. A good combination of great litter box and appropriate litter can make a big difference in this regard – your house will be cleaner, and the inhabitants – healthier and happier. As always, feel free to send us your questions – we’re here to assist. Previous articleThe great debate: Do dogs dream?